Today we were up pretty early (for a Sunday) even though we were out late last night with friends. We went to a mystery theater dinner in Winona at The Innsville restaurant. It is one of the last true Inns in the Golden Horseshoe (an area from Toronto to Niagara) It dates back to the 40’s and 50’s when locals went to see the only live entertainment around. We went to have dinner and partake in a mystery “who dunnit”. It was our first time doing anything like this and we enjoyed our selves immensely. We were all given name tags to wear, I was Marilyn Monroe and Philip was the famous Sherlock Holmes. Even though we had all the clues and saw everything that was going on we failed miserably in determining who did it. I guess we would make lousy detectives lol. They have a set menu to choose from (which is not vegan) however they were very accommodating in preparing me some food. The chef actually made a visit to me to ask what I would like and what I would eat. I ended up have a really great rice and vegetable dish and salad. For dessert they made me a raspberry sorbet which was very yummy and made my friends rather jealous. 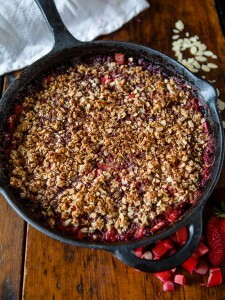 Philip has been pestering me to make one of his favorite desserts, strawberry and rhubarb pie, but I said pastry is too filling so we agreed on crumble. Back to why we got up rather early for a Sunday, we wanted to get another jog in. We call them jogs because we don’t actually run fast, thats something we leave for runners lol. 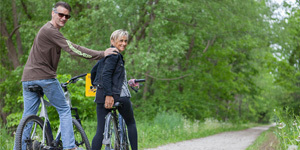 We just want a nice healthy slow jog to help keep us fit. Well the wind was certainly ferocious this morning by the lake, it was making white caps and some spectacular splashes coming right over the retainer wall. Jogging one way was rather easy (going with the wind and having it push us) but coming back into the wind was brutal. The cold was biting at our ears and stinging our eyes, but after we were done we felt great that we’d made it back alive. 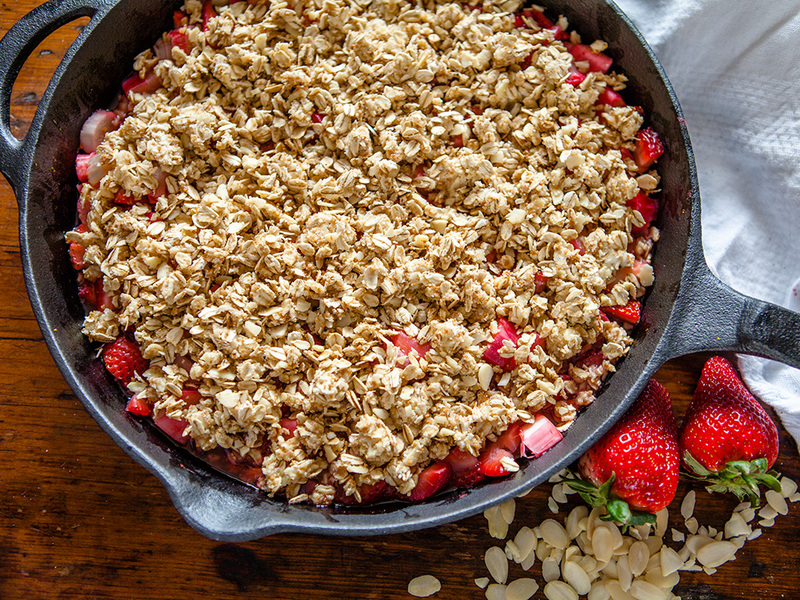 To find the rhubarb for this recipe we had to venture into Oakville where Wholefoods is located, I’ll be extremely happy in May when our local farmers market opens which is only a 5 minute walk away. 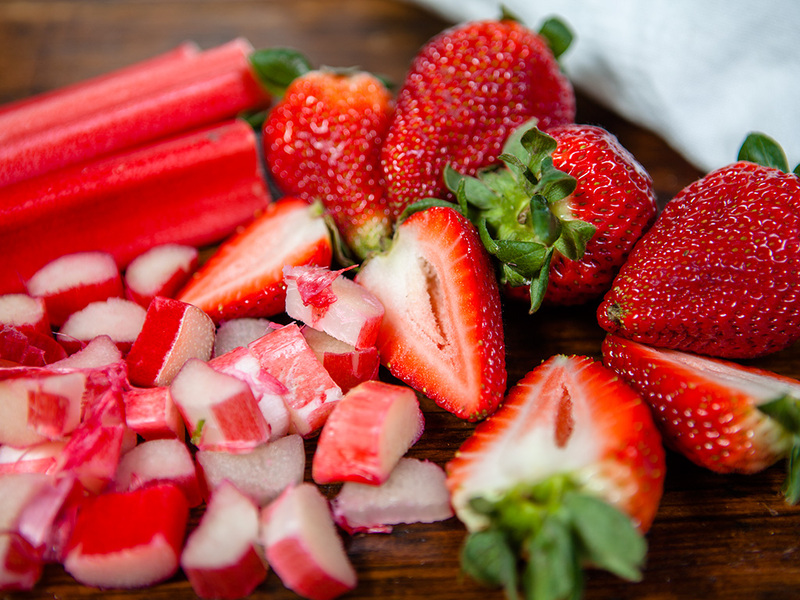 Philip does like the mixture of sweet strawberries and tart rhubarb, did you know rhubarb is actually a vegetable similar to celery? 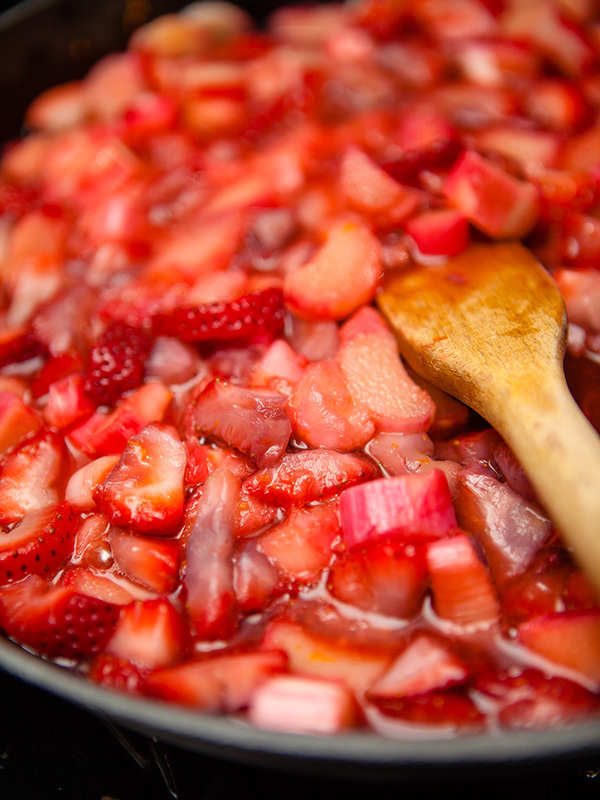 So don’t just use rhubarb in desserts, it’s quite good in all kinds of recipes, like chutneys. 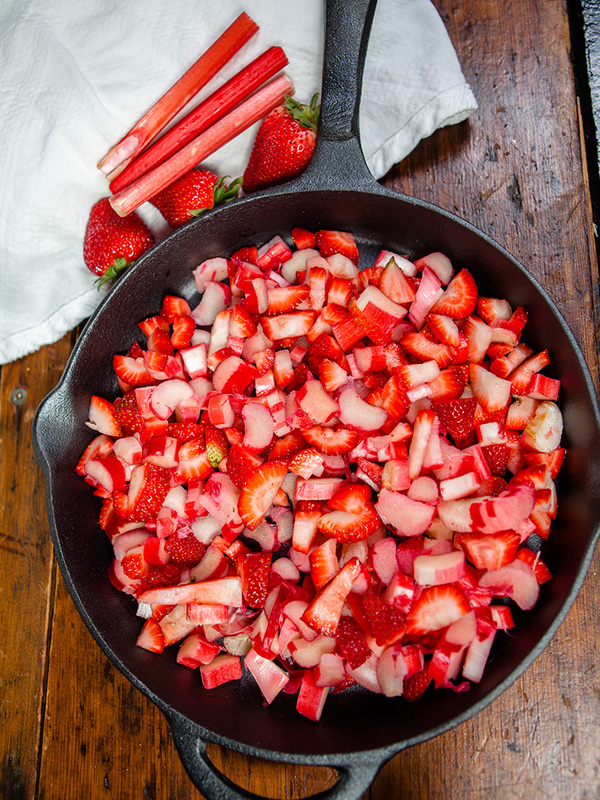 I used our cast iron skillet for the cooking of the strawberries and rhubarb since it can go right into the oven from being on the stove. 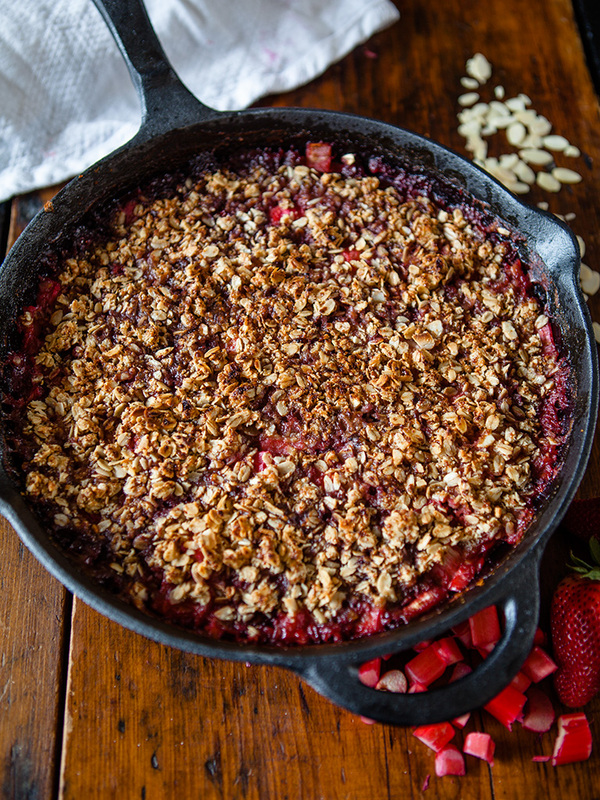 The “crumble” portion of this Strawberry and Rhubarb Crumble consists of oats, almond meal, slivered almonds, cinnamon, vegan butter and only 2 tablespoons of sucanat. This recipe does not have a lot of sugar in it since the cooking of the fruit brings out natural sugars for sweetness. 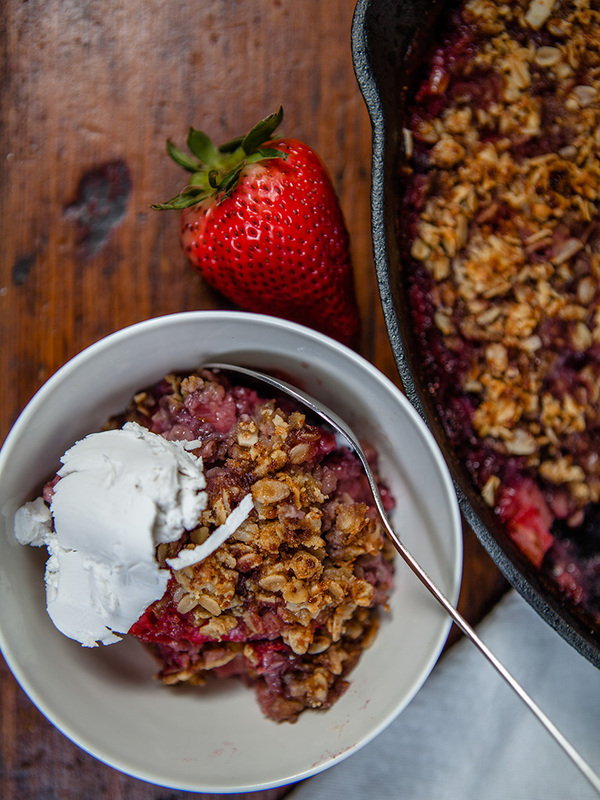 I topped my bowl of rhubarb and strawberry crumble with some delicious coconut cream, but just a little since it’s very high in fat! but tastes delicious. 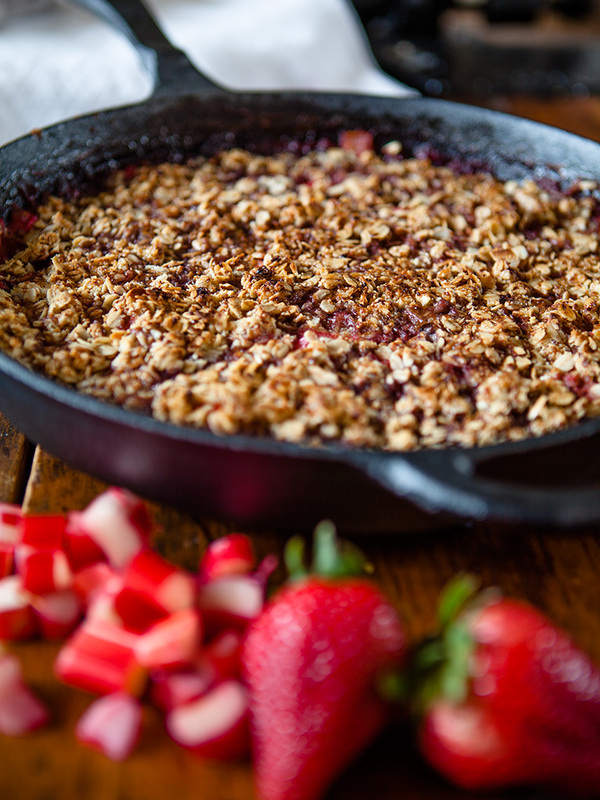 In cast iron skillet place all the filling ingredients cook on medium low until fruit is a little soft for about 10 minutes. In a bowl combine all the crumble ingredients. Rub the butter throughout the mixture either with yours hands or pastry knife. Butter should mixed well into oat mixture so that you can't see it. Place skillet in oven bake for 20 minutes. Check to see if golden brown if not broil 5 minutes. Serve with your favourite vegan ice cream or just coconut cream.